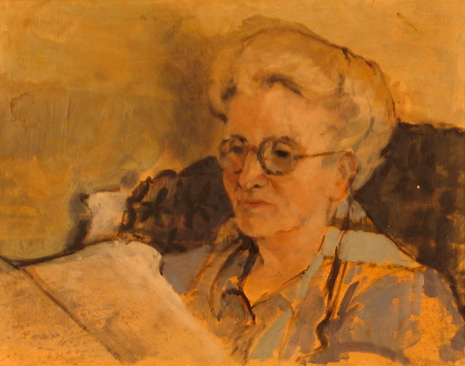 Portrait of Miss Eva O’Flaherty in Achill, 1947, oil on cardboard, by Derek Hill, part of the Dublin City Gallery Hugh Lane collection. Hill presented the painting to the gallery the year Eva died, 1963. THE exotic allure of Achill Island has long been reflected in the paintings and writings of many distinguished artists: Paul Henry, John Millington Synge, Heinrich Böll, Robert Henri. These evocative tableaux sometimes romanticised the grim privations of life for the peasant farmer during the lofty period of the Celtic Dawn. However, little-known ascendancy feminist Eva Marie O’Flaherty seamlessly straddled the parallel world of fragrant soirees, economic enterprise and political activism. While the Cumann na mBan member grew up amid the Georgian splendour of Lisdonagh House, on the shores of Lough Hacket in Caherlistane, Co Galway, and flitted through the café society of London and Paris, her spiritual home became the remote Achill Island. There, she established St Colman’s Knitting Industries and was a co-founder in 1910, alongside Darrell Figgis, of Ireland’s oldest summer school, Scoil Acla. Now in Mary J Murphy’s new book, entitled ‘Achill’s Eva O’Flaherty – Forgotten Island Heroine (1874-1963)’, the compelling narrative of a colourful life that spanned two centuries, and two disparate worlds, is revealed. Educated in both Mount Anvil and Alexandra Colleges in Dublin, Eva O’Flaherty – with a lineage that connects to pirate queen, Granuaile – pursued a career in millinery, in both London and Paris, before settling in Achill. Serendipitously, Mary J Murphy lives in Caherlistrane and, like her heroine, owns a home in Achill, to which she regularly escapes with her husband and three children. Indeed, she tells The Mayo News that the genesis of this charming tale can be traced to a GAA match in Caherlistrane. “The book came about quite by accident when my husband casually introduced me to Brendan Gannon at our GAA home pitch in Caherlistrane in August 2009. It transpired, during the course of our chat, that Brendan had met Eva O’Flaherty in Achill in the late 1950s when he was called out in his capacity as a Hoover sales representative to fix a knitting machine in St Colman’s Industry. Brendan had known of the O’Flahertys of Lisdonagh House and knew that Eva had come from there originally,” she explains. Thus began Mary’s historical adventure into the sepia-tinged world of Eva O’Flaherty, who moved ‘just millimetres outside the charmed circle of Irish nationalism’ but who preferred to fly under the radar as a ‘salon hostess, employer of 30 women, patron of the arts, fashionista and mistress of her own destiny’. During her busy life on Achill, Eva spent her evenings as hostess in her lamp-lit Dooagh home to revolutionary and MP, Constance Markievicz, Douglas Hyde, Padraig and Willie Pearse, Cardinal Dalton, George Russell and Dr Kathleen Lynn. And then, as dawn approached she would head off to her burgeoning little industry, just down the hill from the famous Deserted Village, St Colman’s Knitting Industries, which nowadays is another cultural hub, Abha Teangaí. From its inception in around 1912, St Colman’s quickly developed an extensive clientele from all over Ireland, providing much-needed employment for the women of Achill. These women knitted high-fashion garments, such as smart suits and twin-sets, which were sold to Brown Thomas and Arnotts, Sloweys and Switzer, as well as being exported all over the world. “Seven hours sleep for a man, eight for a woman and nine for a fool.” A great industrial success, St Colman’s pervaded until O’Flaherty, a spinster, died aged nearly 90 in 1963, and finally closed in 1970. A former journalist, who specialised in feature writing, Mary J Murphy (pictured)helped establish a newsagency in Dublin, has interviewed Jimmy Carter and Tammy Wynette, and worked in London, New York and Iceland. She has worked as Press Officer for the Galway Arts Festival and as a music columnist for The Connacht Tribune for two decades. Mary is married to Gerard Glynn and lives near Caherlistrane (and on Achill) with her three children, Morgan, Mason and Minette, and Ruby, the dog. ‘Achill’s Eva O’Flaherty: Forgotten Island Heroine’ will be launched at the opening ceremony of Scoil Acla, at Gielty’s pub, on Monday, July 30, at 8pm.